Maxine Hart kicks-off 2016 as our new artist who has loaned a wonderful selection of work to inspire, enrich and enliven our workspace at The Peloton. We have an on-going programme to fill our walls with beautiful images throughout 2016 from the host of local Cornish talent available. Cornwall is a rich, buzzing and vibrant county full of artists interpreting the landscape and seascape, celebrating the unique place where we live. 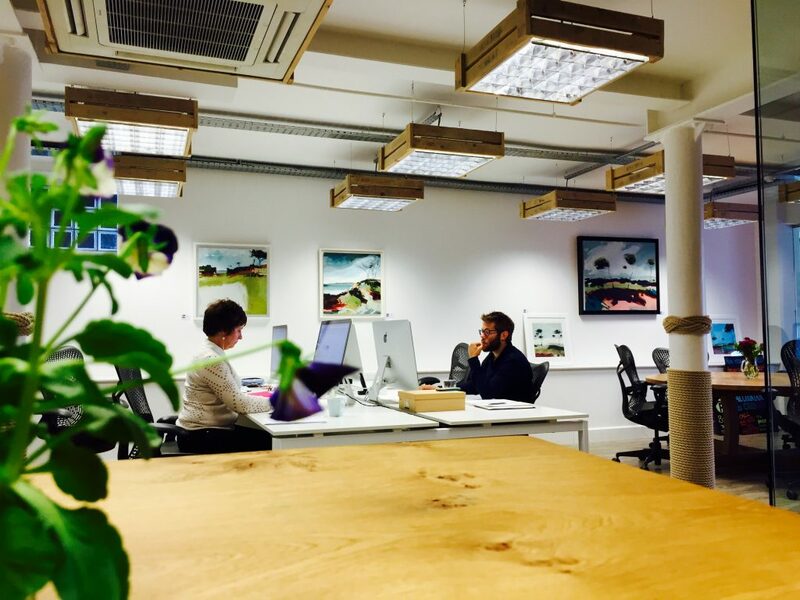 The Peloton is also a unique place to work; our clean minimal space is a perfect backdrop to show off images and, for us, an opportunity to work and meet our clients surrounded by stunning paintings. Jo: Maxine, tell us where your favourite place is to paint in Cornwall? Maxine: It’s about light, it can be anywhere, but the Helford is one of my favourites because of the trees and water, with woodland going down to water. Jo: Have you ever painted anywhere really dangerous – like the edge of a cliff? Maxine: No I’m not very good with heights! I wouldn’t sit on the edge of anywhere – I have sketched with the elements; rain, wind. Mixing the sand and charcoal with my paper on the beach – drawing or painting on pebbles. Jo: Have you ever painted a picture you are most proud of? Maxine: Things like portraits – one of my Nan or animals for owners. Massive big paintings for my degree show. A great colour you’re using but really I’m always moving ahead. Jo: Where would your dream place be to have your art exhibited? Maxine: Royal Academy, Summer Exhibition – did it a couple of years ago! I want to crack Cornwall first before being any more ambitious. Jo: Do you paint when you’re outside Cornwall? Maxine: Yes; wherever I am I have a sketch book or camera – Exmoor – everywhere and anywhere inspires me; landscapes, seascapes.